Attributes are tags, or labels, for blocks. You can use attributes to add any text to a block. For example, attributes are often used to fill in the text in a title block. By placing the attributes where you want them in the title block, you can facilitate the entering of the text. You can also use fields in attributes, to automate some of the text entry. You can extract the attributes in a drawing to a table or external file. When you do this, you can use the attributes to create a simple database. You could import it into Excel and manipulate it there. If you’re using attributes to create title block text, you’ll be working in paper space on a layout. If you’re using them to create labels in the rest of your drawing, you’ll be working in model space. Choose Home tab>Block panel (expanded)>Define Attributes (ATTDEF command) to open the Attribute Definition dialog box. Invisible: Creates invisible attributes that you can extract, but don’t want to display in the drawing. Constant: Sets a constant value so that you don’t need to fill it in each time. You cannot edit this value. Verify: Prompts you to verify the value, useful when you have a preset. Preset: Inserts a default value, but you can edit it if you set the ATTDIA system variable to 1. Multiple Lines: Allows an attribute to contain multiple lines of text. You can also format attributes in a simplified text editor. Check the Lock Position check box to lock the position of the attribute relative to the block, so that you can’t grip edit it and move it. In the Attribute section, specify the Tag, which is like a field/column name for the attribute. 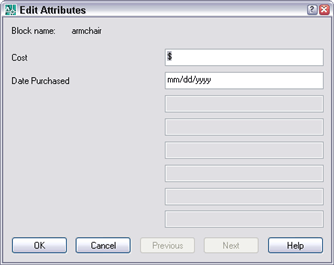 For example, enter Cost if the attribute will contain cost information. The tag is converted to uppercase and cannot contain spaces or exclamation points. Enter a prompt, which is similar to the tag, but can contain spaces. Enter a value to set a default value. In AutoCAD 2008, this is called the Default. To insert a field, click the Insert Field button. In the Text Options/Settings section, choose a justification, text style, height, and rotation. In the Insertion Point section, check the Specify On-Screen check box to specify the location of the attribute. Otherwise, enter the desired coordinates. Click OK. At the prompt, specify the location if prompted. When you’re ready to insert the block, you can specify attribute values on the command line or in a dialog box. 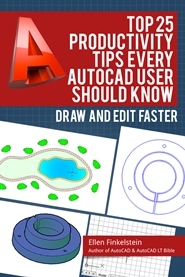 The default depends on which AutoCAD release you’re using. To use a dialog box, change the value of the ATTDIA system variable to 1. Use the INSERT command to insert the block. 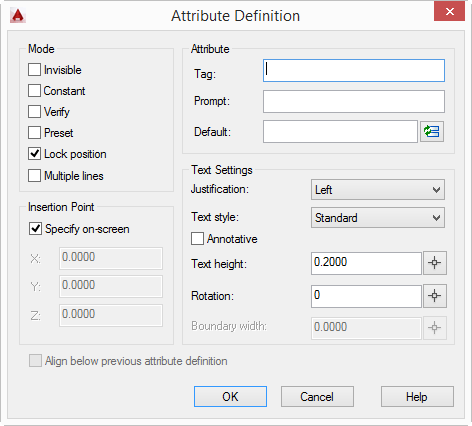 For instructions, see “Insert a block in AutoCAD.” If you set ATTDIA to 1, you then see the Edit Attributes dialog box, where you specify values. Otherwise, you see a prompt on the command line. Any default values that you entered are shown in the text boxes. Enter the desired values and click OK. The block now shows the attributes (unless you set them to invisible). the same default style. ??????? thanks to everybody for this discussion, you are very helpful !! How can I edit a block attribute title block text with out changing it globally. 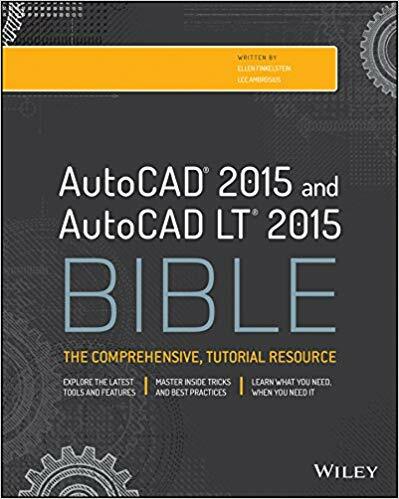 I am using AutoCad LT 2008. I want to add a letter to the number sheet but it is to big. Thank you so much for your tutorial it is great. I had one question while trying to do this. I have created my attributes, and selected them in the correct order when creating the block. The only thing that is missing is when I insert the block it doesn’t automatically pop-up the edit attributes dialog box. If I click on the attributes it will bring it up, but I was under the impression that if I have done it correctly when I insert the block it will automatically bring up the dialog box. I have set my ATTDIA to 1. Any suggestions? When I insert a block with attributes, the prompt comes up automatically. I’m not sure what that wouldn’t happen. Were all the objects that make up the block separate objects (not already in a block) when you created the block that included the attributes? Hi, thanks for the tips and website – very helpful. You would need to delve deeper into the feature, though. I cover them in my book. messing around with dynamic blocks in autocad v.2012. never got any satisfactory results. Any ideas? In the Attribute Definition dialog box, there’s a Multiple Lines checkbox that lets an attribute contain multiple lines. Hi Ellen, I am trying to create an electrical terminal block (wire, teminal, PLC I/O number are all related), and I want to reuse an attribute multiple times within the block with different prefix or suffix notation to represent the various required fields. I can see the style of notation required with fields but I not with attributes. is this possible? I’m not sure what style of notation you need. Would just copying the attributes work? If an attribute is copied then you have two attributes with the same tag, (the attribute manager shows then in red as an error) but they are independent and each needs to be entered individually. Essentially I would like to use the attribute like a field where I can concatenate attributes and strings together, and possibly even do simple math on an attribute value. As it stands I need to enter multiple attributes all based around the same number (or an offset of that number)for each PLC input or output. if I only needed to enter the PLC Rack, Card and Input number then much of the repetition would be removed and errors could be avoided. I do not know if what I am trying to do is possible in Autocad, but i see similar capabilities in field, so I am hopefull. Can i define attributes only blocks? Actually, i would like closed lines (like premises), which have some attributes. I use autocad map3d2011. Attributes are only for blocks. But there’s a feature to let you display properties of non-blocks, called Data Extraction. I’M CREATING ATTRIBUTES FOR MY TITLE BLOCK. WHEN I CREATE FOR EXAMPLE “SHEET NUMBER” ATTRIBUTE, I CANNOT SEPARATE THE TWO WORDS, IT SHOWS ON MY TITLE BLOCK AS “SHEETNUMBER”. SHOULD I CREATE ONE ATTIBUTE FOR ‘SHEET” AND ONE ATTRIBUTE FOR “NUMBER”? ALSO, IS IT POSSIBLE TO ALIGN THE TEXT ATTRIBUTES? I’m not sure about your 1st question. About this one, when you create the 2nd attribute, there’s a checkbox in the dialog box that aligns the 2nd one under the 1st. Thanks Ellen! As far as my first question, how can I create a text attribute that contains two words that must be separated? I have exactly the same question as Jeff. I need to make a block with an attribute that has a preset list of values.till now I’ve been using the visibility parameter and it works. The only problem is when I want to add a new value to the list. Is there any way to do this using the lookup parameter? Second, my actual question! I was taught CAD on Microstation, so I am used to just creating text fields that I can fill in later, no definitions needed. If I wanted to insert a blank field for someone to fill in with an appropriate value later (i.e. 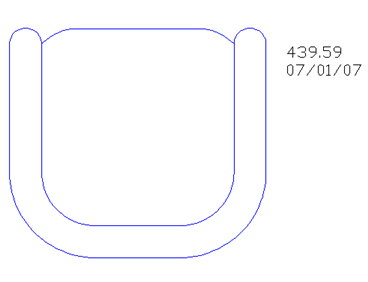 “IN_” where they’d put a number in the field), is that possible to do in AutoCAD? I’d like it to literarlly look like “IN_”, and all the field options I’ve seen won’t let me personally define the field name. There isn’t a set data set for the field, so I won’t be using an excel sheet to populate the fields. I’m a pretty big novice when it comes to stuff like this, so let me know if anything I asked needs clarifying. Thanks! I cannot type text height in the Attribute Definition Box now, although was able to do that in a previous project. Can you tell me what to check or what might be going wrong? I have created a block with several attributes. I forgot to make 2 of them invisible. I can’t for the life of me figure out how to edit this. I’ve created a block with attributes and for safety reasons I’ve deselected the allow exploding option, but to my surprise all the grips of the attributes of this block also disappeared which is not very handy. To move an attribute for an individual case it is only possible with the original “-attedit” command. Is it possible to turn the grips on for the attributes for these types of blocks? Is it possible to add a default letter to an attribute. I have an attribute where I have to enter several valuenumbers. behind several of these values there have to stand different abbreviations (MW, P, rpm, V, A, mA, ….). So is it possible to add these abbreviations, so that I just have to enter my numbers and that the abbreviation automaticly shows up. Now I always enter the number and the abbreviation, but it will save me a lot of time if I just have to enter the number. Try this post: https://allaboutcad.com/tutorial-create-attributes/. Look at the Preset option. Hi Ellen Can I add more tags to an already created attributes?? I have made a quite complicated dynamic block (26 invisibility parameters and 81 block attributes), now I have to create a translate this block, but therefor I only have to change 5 attributes. Is there a way to copy the block defenition and assign a new name without losing the parameters? Now you have two very similar blocks in the old drawing. Hope this helps! 1- Is it possible to have multiple instances of the same attribute inside one block? For example, if I have two visibility states and I want one attribute to appear in different positions on each one of them. 2- Is there a way to flip attributes so they remain always horizontal? I tried to apply two flip actions to an attribute (one horizontal and one vertical). The vertical works fine – only the position of the text is flipped, but the horizontal flips the position as well as the text orientation… is there another way to do this? hi.first i want to thank you for all nice efforts . and i hope you increasing successfully. then i want to ask about attribute how can i make drawing title to reading in layout from drawing title in folder ? I am working with attribute within a dynamic block. In the dynamic view I have the attributes turned on, all of them are on except two. i can’t figure out why they wont turn, they are showing that they are on in the block editor. I used sync, but still will not show up. any ideas? In the block editor, check the properties on the missing attribute definitions to make sure the “Invisible” flag is set to “No”. Otherwise, are you being prompted to fill in the missing attributes when you insert the block or do they show up when you use the Enhanced Attribute Editor? You mention “sync” in your post. I assume you mean the command ATTSYNC (attribute sync). If not, try ATTSYNC which should synchronize the attributes of any existing instances of this block to match the attribute definitions of the current block definition. How do you rotate a block with attributes & have the attributes’ orientation remain upright? In the block editor there is ‘Match layout orientation’ but that’s for the whole block itself & there doesn’t seem to be anything like that for the attributes. this tutorial helps me a lot. I understood how to create attributes. But I have one doubt. What is the main purpose of creating attribute? Please explain me about the purpose of attribute and defining block. Very good topic of making attributes. I have tried to find a method for making a text line thats automayicly copiyng the text. example: if i write E 510-0 it will automaticly make same text in the corner of my paper. how do i make it?? How make d attribute section @ section line …? When we insert the block attribute using “ATTIN” Command, is it possible to insert with a leader ??? Awesome help in Deed. Thanks to Ellen Finkelstein. I was wondering, I know that you could reference attributes to other block attributes by linking the fields, but what I was trying to create is a block that you could attach to any given block in the drawing and when attached it should automatically copy the attributes of the original block, think of it like an equipment tag that when attached to any equipment block, attributes should be copied into the tag.